It is so interesting to read original documents from the nineteenth century. 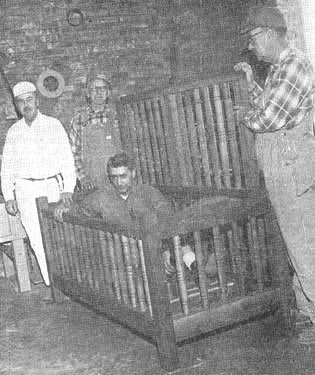 It gives us a great insight into how people viewed the “insane.” The following articles feature Dr. William A. Hammond, who fought to remove all mechanical restraints, including the infamous “Utica Crib,” from New York State Insane Asylums. The first article was written by Dr. Hammond in March of 1880 and was published in The International Review. The second article from the Utica Morning Herald and Daily Gazette published on November 25, 1879, argues that Dr. Hammond was making “reckless and wholesale charges,” it also refers to the inmates as “unfortunate creatures” as if they were not human beings. What I discovered was that the Utica Crib was invented by Dr. M.H. Aubanel, of the Marseilles Lunatic Asylum in 1845, and was introduced at the New York State Lunatic Asylum at Utica in 1846 by Dr. Amariah Brigham, the first Medical Superintendent. (SOURCE: The International Review, The Treatment Of The Insane by William A. Hammond, Volume VIII, March 1880, New York: Barnes & Company, Page 236). DR. HAMMOND’S ATTACK ON THE ASYLUMS. Following this is what purports to be a cut of the Utica crib. 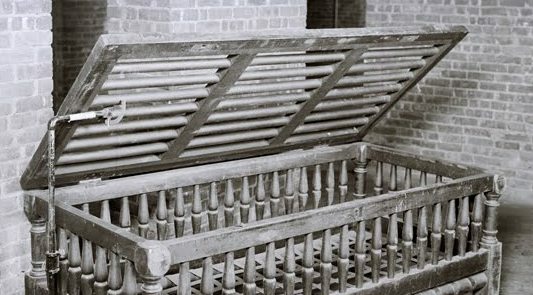 Any one of the thousands who visit the state asylum every year and are shown the covered bed in use at that institution will bear us out in saying that the picture looks as much like the bed as a peach crate does like a cradle. The cut looks like a chicken-hatching machine, and is simply a burlesque upon the truth, for which there is no possible excuse. A REPORTER IN A CRIB. A reporter of the Herald visited the asylum, yesterday, and requested permission to examine one of the cribs which he had frequently seen in visits to the asylum. DR. GRAY cheerfully gave the permission, and the reporter had an opportunity of selecting one of five or six of the covered beds or “barbarous devices,” for actual experiment. Simply removing his outer coat he got into the crib, which was in condition for use, and the lid was closed down upon him. As the reporter is nearly six feet in height, and weighs two hundred and seventy six pounds, and larger in every respect than any patient in the asylum, it will be admitted that this test was a fair one. When the lid was closed the occupant laid with perfect comfort upon either side and upon his back. When lying upon his left side the position was sufficiently easy to permit him to write his description of the covered bed if he had chosen to do so. The hands and arms could be put between the smooth wooden rounds which formed the slatted top, and there was a perfect circulation at the sides and top. The bed was easy and comfortable and there was an abundance of room for lifting the head from the plump pillow so that the lower end of the bed could be seen with ease. In short the reporter found that he could roll and toss about at will as easily as he could in his own bed at home, but he could not get out of it – and this is the humane plan of the device which is styled “barbarous” – as will be seen hereafter. THE COVERED BED AND ITS USES. The patient, tho’ insane at intervals, really had more sense than those who denounce what they appear to know little about. Covered beds, patterned after those in use at the state asylum, are used in St. Elizabeth’s and other hospitals of Utica and thro’out the state, and they are daily seen and examined by visitors. So simple and harmless is the contrivance that parents, after seeing them, inquire, “Why would not this be a good plan to prevent our babies from falling out of their cradles?” It certainly would. THE USES OF COVERED BEDS. The covered beds are used to secure the excited and restless patients, the requisite quiet and sleep in a horizontal position, that are absolutely necessary for their recovery. Insane people are sick people. When a sane person is sick his physician directs that he shall lie in bed, and a sensible invalid always obeys the orders of his physician. When an insane person requires rest he may be ever so much disposed to obey the doctor and lie in bed, but his mind is disordered and his will is gone so that he can not control his own actions. The result is he is liable to exhaust himself by getting in and out of bed at frequent periods, risking chances of falls and exposure to cold. Epileptics and paralytics are apt to fall out of open beds and receive severe injuries. If such beds are not used, other more objectionable systems would have to be put into practice, such as the “bed strap,” for holding excited patients in the ordinary beds, or the forcible holding of the patient by attendants. This latter method better deserves the title of barbarous than does the covered bed system. No one or two attendants can hold an excited patient in a bed without using a force that must be more or less cruel and the marks of their grasp will not fail to be undeniably imprinted upon the delicate arms, body or limbs of the invalid. Insane people are endowed at times with extraordinary strength and the utmost exertions of strong men are required to quiet them. The use of the strap is harsh and at times injurious. THE ORIGIN OF COVERED BEDS. The crib, or covered bed for restless patients, is not a new device and was not introduced by the superintendent of the state asylum at Utica as DR. HAMMOND alleges. It was devised in France by DR. AUBANEL of the Marseilles lunatic asylum, in 1845, and described in the Annales Psychologniques of the year. DR. BRIGHAM, in 1846, introduced the crib bedstead into the Utica asylum, and was described in the American Journal of Insanity in that year. In 1852, DR. WILLIAM WOOD, medical official of Bethlem hospital, England, improved upon the crib bed, and gave a description of the same in Winslow’s Journal of Psychological Medicine. This bed was like a child’s crib but the covering was of webbing. 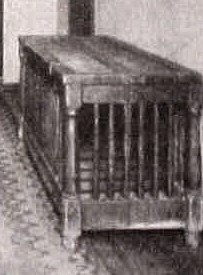 In 1854 the AUBANEL bed was abandoned in the Utica asylum and the present one was put into use, resembling DR. WOOD’S, with this exception – the sides were made with rounds like an ordinary child’s crib instead of with boards like the English bed, and a round slatted corner in place of webbing, which powerful patients could easily displace. The above is high authority in approval of the covered bed from professional and practical men who have daily opportunities of testing its merits. Laymen or friends of those who are confined in asylums can examine these beds in the Utica asylum and judge for themselves whether they are “barbarous” or “cruel devices” as has been alleged. (SOURCE: Reprinted from Utica Morning Herald and Daily Gazette. Wednesday, November 25, 1879). This entry was posted in Interesting Articles & Documents, The Inmates Of Willard Blog and tagged Amariah Brigham, Annales Psychologniques, Covered Bed, Dr. Mycert, Dumfries Asylum, Edinburgh Medical Journal, George Alder Blumer, John P. Gray, Marseilles Lunatic Asylum, Mechanical Restraints, Mental Illness, New York Herald, New York State Insane Asylums, Royal Infirmary of Edinburgh, St. Elizabeth’s, Sunday Herald, The International Review, Treatment of the Insane, Utica Crib, Utica Morning Herald and Daily Gazette, Utica State Hospital, William A. Hammond, Winslow’s Journal of Psychological Medicine by lsstuhler. Bookmark the permalink.